Millennium 7 Publishing Co.: Maybelline - Winning At Social Media? 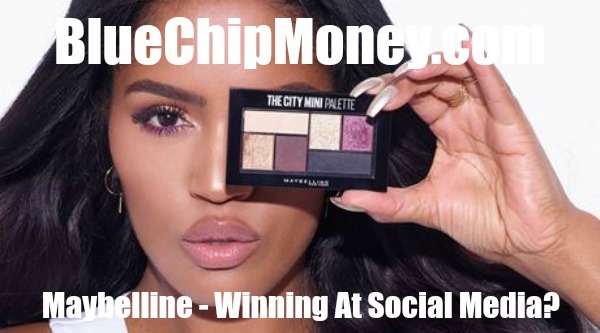 Maybelline - Winning At Social Media? Among beauty brands, Maybelline is the master of driving social media engagement.. The L’Oréal owned brand has beat out its parent company, as well as competitors including Estée Lauder and Revlon, in cross-platform engagement since the start of the year, according to recent analysis from ShareIQ, a social analytics company. On Instagram, for example, Maybelline saw a total of over 59 million likes between the start of the year and October 20, compared to L’Oréal’s 27 million likes and Estée Lauder’s 5 million likes during the same period. At the same time, Maybelline far outdid the competition on Pinterest, garnering 730,000 repins, compared to L’Oréal’s 167,000 and Estée Lauder’s 28,000. Most beauty brands find the volume of visual content that’s shared on Instagram and Pinterest, and the accompanying signals, to be more valuable than Twitter data, according to Jonathan Gardner, ShareIQ’s director of marketing who conducted the research. Related Article: Building YOUR Brand With Social Media? These results are all thanks to a combination of frequent, educational posts, savvy influencer relationships and a collaboration with Gigi Hadid. “Maybelline has been keeping a baseline of fans engaged and are building spikes of excitement with new and influencer content, earning engagement with new audiences,” said Gardner. Indeed, throughout the year, at least every other post on Maybelline’s Instagram account has either featured or mentioned an influencer, ranging from the beauty vlogger Melissa Flores (37,000 followers) to the fashion blogger Nicole Alyse (over 89,000 followers). Most of this content -- which includes both pictures and short “get the look” -style videos -- is generated by the influencers themselves and tagged with #mnyitlook, as encouraged by the brand in their Instagram tagline. The best responses have the chance of getting reposted. “We know that our customer is looking to beauty influencers to provide beauty trends and education, so it’s important for us to incorporate their amazing content on our channels and partner with them to communicate to their audiences, as well,” said Marnie Levan, Maybelline’s vice president of integrated consumer communications. But with so many beauty influencers out there today, Maybelline has a few criteria: "We try to find those who authentically talk about and use the brand’s products regularly," said Levan, "as well as those whose content is not just engaging but also educational for the consumer." This past August, the brand took that relationship one step further, launching its first influencer-driven product line with popular beauty blogger Shayla Mitchell, who boasts 2.5 million followers on Instagram. Curated by Mitchell, the “Maybelline x Shayla” collection included a shade extension of the brand’s Colossal Big Shot Mascara and a new rendition of its City Mini Palette. Mitchell’s goal, according to an interview with Refinery29, was to create products that worked for all skin tones. The surrounding social media campaign -- which saw posts shared across all of Mitchell’s social accounts, as well as Maybelline’s -- was the brand's most successful to date, said Levan. The collection sold out on Ulta.com within a few days of the launch and is continuing to sell impressively in stores, she said. Outside of this influencer-centric content, the brand’s Instagram account features a stream of swatch posts — in which different shades and textures of a certain product are shown on a model’s wrists — as well as staged, artful product shots. Another factor in Maybelline's success is how often it's posting: On Instagram, it shares an average of five posts per day, compared to L’Oréal’s average of four and Estée Lauder’s average of two, according to ShareIQ. And then, of course, there’s Gigi Hadid. Although she’s been spokesperson of Maybelline for a few years now, Hadid launched her first collection with the bran in early October, soon after her makeup artist, Erin Parsons, became the company’s global makeup artist. While relying on a celebrity for influence is by no means a novel idea, Maybelline has been particularly smart about leveraging the opportunity, said Garner. It ensures that Hadid posts frequent Maybelline-centric content to her own Instagram account, where she has over 36 million followers. In the 48 hour period surrounding the lines UK launch on October 12th, she shared 7 related posts. What's more, Hadid always mentions Maybelline in the tags and comments, a strategy that helps push her many owned followers to the Maybelline account, said Gardner. After the model announced the first online sale of the line on the Boots UK website, the product sold out in 90 minutes. Guest Authored By Jessica Schiffer. Jessica is a Fashion and Beauty Reporter for Glossy, Who What Where, V Magazine, CherryBombe, Into The Gloss, Man Repeller and Time. Follow Jessica on Twitter. Related Articles: Entrepreneur Social Media Influencers? “Maybelline has been keeping a baseline of fans engaged and are building spikes of excitement with new and influencer content, earning engagement with new audiences,” said Gardner..